15 Foot Castle Slide Shown with Detachable Pool this will be removed for Dry Use. 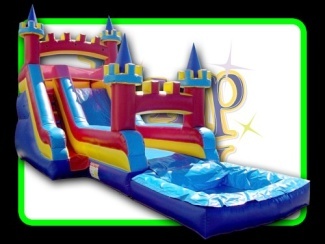 This is a unique 15 foot Castle slide will define your next party it provides you with great entertainment that will keep going. Jumpmaxx is always looking for new and exciting units to keep all your small and big guest happy and busy. After all busy people make great parties. Please measure the area to make sure it will fit in the space required. Order early for best selection! JumpMaxx prides ourselves in providing America with newer, cleaner, high end entertainment with inflatables like the 15 Foot Castle Slide and many others.